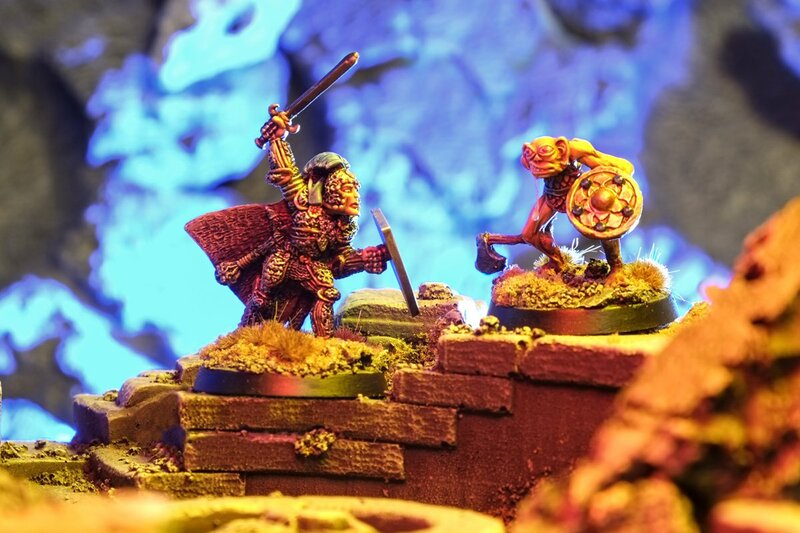 James over at Gonzo History is running a competition inspired by Gary Gygax’s antics designing the original D&D monsters. 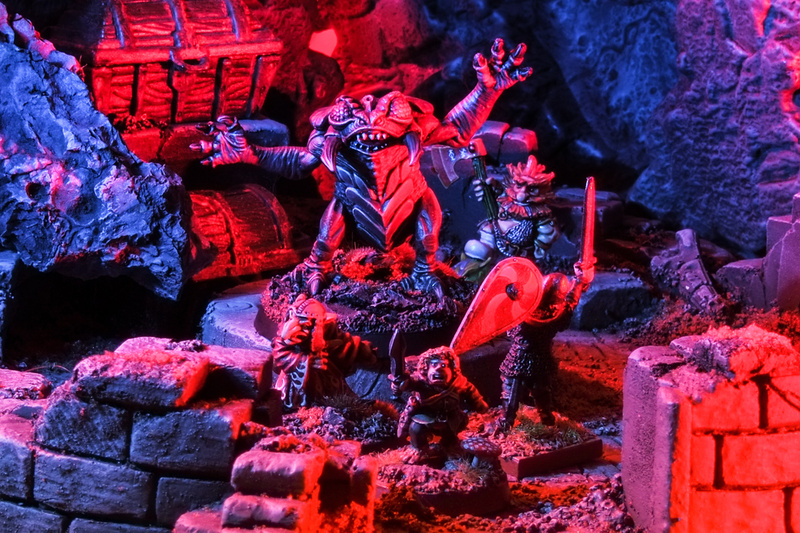 Legend goes that young Gary, looking for fantasy monsters to populate his dungeons, got a bag of cheap plastic monsters from Hong Kong and made up names and rules, bringing Rust Monsters, Bulletes and Owlbears to life for the first time. James’ challenge is to do the same and win fabulous magic prizes. Reinvent it as something different. It’s a challenge about creating a fresh iconic monster. 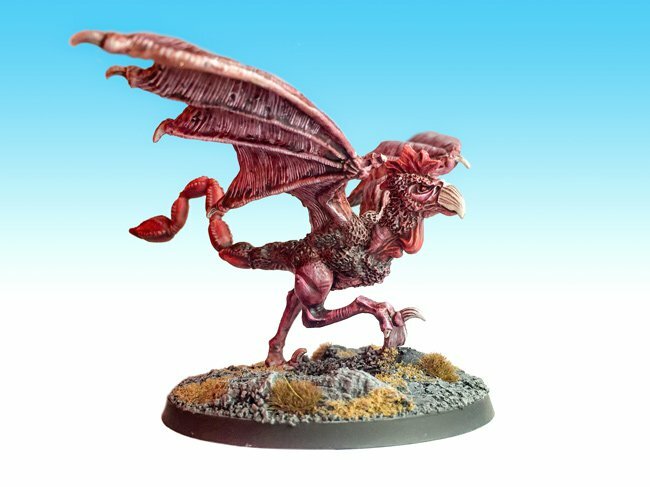 No point finding a cheap plastic toy dragon and painting it to be a … dragon. It’s explicitly not a modelling or painting challenge, so don’t expect to win with technical excellency. Putting the “soul” in sole fish. This monster started life as a free gift with some CBBC kids magazine. I was initially drawn to it because of the armour-plated head, which I thought could be transformed into a cool fantasy fish-helmet. I also thought I could sculpt a samurai armour visor on top and make it into an Oriental Knightfish. But then I realised the toy was not just green but GLOW IN THE DARK. Rather than squander this gimmick under putty and paint I decided to harness it to portray a fish spectre. She’s a shark, and she glows in the dark. I added bloodsplatter to create visual interest, and also to attach it to a gaming base. There’s a steel pin running through the bark base through the bottom jaw of that I’ve disguised as blood dripping out its maw and running off the lowest point of its chin. The Great Wight Shark is an undead giant plate-skinned fish, existing on the normal and negative material planes. They are found haunting the places where their inshore waterways once were – where lakes have dried up or rivers have changed course over time. Great Wight Sharks will attack if their territory is invaded, and can work cooperatively in packs of up to six to hunt prey. Their semi-material jaws, originally for punching through the thick shells of freshwater prey, can penetrate even a knight’s plate armour. Great Wight Sharks have heavily armoured heads and thick thoracic shields with an armour class of 5, though they are very vulnerable to attacks to their fleshy hindquarters where their armour class is 10. Commonly sighted with other aquatic undead species including Stingwraiths, Ethery Eels, Kelpie Kelp, Tadpoltergeists and Vampiranhas. A Great Wight Shark ambushing along the ancient path of the Garradsbane River. Great Wight Sharks are unable to leave the bounds of their prehistoric waterways, which will at first be indistinguishable from regular land. However, the boundaries past which the sharks can’t move can be worked out with clues such as the ruins of old bridges, old maps, or baiting them and seeing how far they pursue. Shouts out to contest sponsors Chaotic Henchmen Productions, Oakbound Studios, Otherworld Miniatures, Grant Howitt and of course Monster Man. Damn, that is a good monster. The gore splatters are exceptional. Thanks Zhu! I’m quite proud of how they turned out. It’s actually the second time I did them – the first time I went overboard and covered the front half. It looked like a goujon that had been dipped in ketchup. I had to soak him in paintstripper overnight. Sometimes less is better. Beyond good? Beyond evil? Beyond your wildest imagination? I love the archeomonster look of him. Great idea and the glow in the dark wins it all ! Thanks! The glow in the dark effect is a challenge to catch on camera! Great looking rendition of a mystical Dunkleosteus! Dammit! Everyone knows what Dunkleosteus are. It’s something obscure that it took a while to find out. Throw them at your players be all means. Being a rubbery plastic they bounce well. That’s super cool. Seriously well done there mate – the model looks really great on it’s own merits as well, based and blooded like that. So THAT’S why as a kid I had a cheap rubbery toy monster that I later remembered looking suspiciously like the Rust Monster from D&D. I always wondered! My childhood was full of cheap plastic knock-offs. I’d really love to own a Spanish Teenage Mutant Hero Turtle moulded in neon yellow with a black mask on. Great wight shark, Tadpoltergeists, vampiranas; thats gold Jerry, GOLD! Thanks Steve! Those names were the most fun I had in writing the post. Glows a lot better than the Frost Giant I just finished with glow in the dark paint. Think I should have used more!